I’m going to show you how to make a voltmeter* with Arduino UNO, an OLED display, 2 resistors and 9 jumpers for less than 5 minutes. With it you will be able to measure Voltage from 0 to 50V (if you exceed it you may damage your Arduino !). Lets begin ! 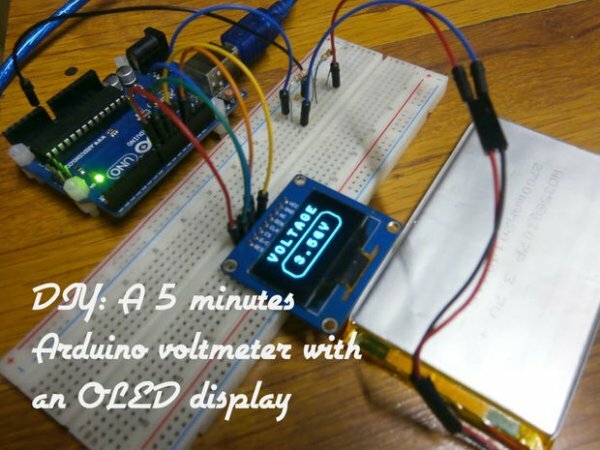 I order to measure voltage we will a build a simple voltage divider, but first place the OLED board on the breadboard. Then connect pin 13 to CLK, pin 11 to DIN, pin 9 to CS, pin 8 to D/C and pin 7 to RES. 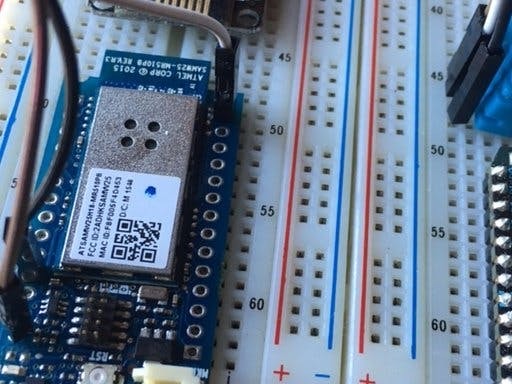 Pins: 13, 11, 9 are the SPI Bus of the Arduino UNO board. Now we build the voltage divider, plug the resistors on the breadboard and connect them for each other, the other side of the 100k resistor connect to ground, the connection between both reistors to analog 0 and the other side of the 10k resistor to the source you wish to measure, like on the schematic above. After that move to the next step. We are now going to program the board. The first step is to plug in the USB cable in the board and the other side in your PC.